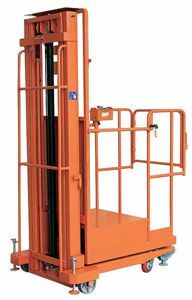 This semi electric order picker is electrically lift and manually pushed, it has been introduced as a lighter version of battery/electric operated lifting platform with the features that the operator will stand over the rising platform under full protection of railings and go UP by pushing the UP button & come DOWN by pushing DOWN button. The platform can accommodate one person with small packages, tools etc. S2S Create & Engineering Co.,Ltd is a professional import of semi electric order picker from China. Besides, we also provide clients with electric pallet truck, electric stacker, electric reach truck, electric tow tractor, scissor lift, manual warehouse equipment, customized truck, and more. With high quality and competitive price, our products have been quite popular among customers from as many as 40 countries and regions, and many of our products have obtained CE and ISO9001:2008 certification. If you're interested in our semi electric order picker, please contact us freely.